Working with Aluminum, Aluminum Alloys, Steel, Plastics- Perkins Engineering Co., Inc.
but can’t find the specified material? Perkins Engineering has both the resources and the experience in purchasing and machining, not only common materials, but also a long list of uncommon materials. 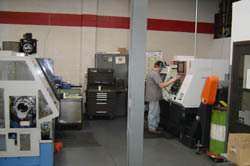 From aluminum and stainless steel to carbon steel and plastics, Perkins has machined a wide variety of materials.